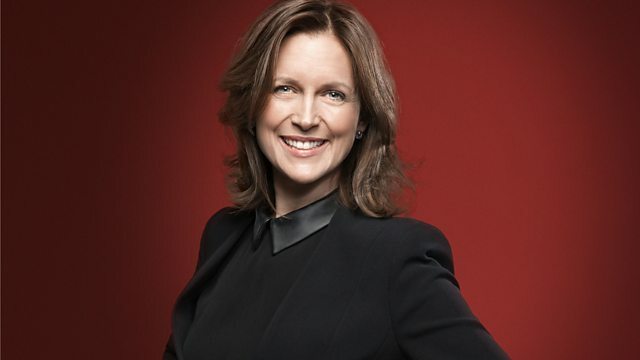 Katie Derham presents Ravel's opera L'heure espagnole from the Orchestre de la Suisse Romande under Charles Dutoit. Plus music by Dickinson, Ferdinand David, Copland and Poulenc. Katie Derham presents today's Opera Matinee - Ravel's L'Heure espagnole in a performance by the Orchestre de la Suisse Romande conducted by Charles Dutoit. Ravel's comic opera is set over an hour in the clockmaker Torquemada's shop in Spain. Torquemada's wife Concepcion makes full use of the large clocks in the shop to hide her various lovers from her unsuspecting husband. Followed by music with French connections from the BBC National Orchestra and Chorus of Wales, featuring recent studio recordings from two Radio 3 New Generation Artists, plus Poulenc's glittering Gloria. Singer: Daniela Mack. Singer: Julien Behr. Singer: François Piolino. Singer: Elliot Madore. Singer: David Wilson‐Johnson. Choir: Grand Theatre of Geneva Chorus. Orchestra: Orchestre de la Suisse Romande. Conductor: Charles Dutoit. Performer: Annelien Van Wauwe. Orchestra: BBC National Orchestra of Wales. Conductor: Perry So. Orchestra: BBC National Orchestra of Wales. Conductor: François‐Xavier Roth. Performer: Peter Moore. Orchestra: BBC National Orchestra of Wales. Conductor: Perry So. Choir: BBC National Chorus of Wales. Orchestra: BBC National Orchestra of Wales. Conductor: Thierry Fischer. Singer: Marita Kvarving Sølberg. Choir: BBC National Chorus of Wales. Orchestra: BBC National Orchestra of Wales. Conductor: Thomas Søndergård. Toledo. The clock shop of Torquemada. Clocks of various shapes and sizes stand around Torquemada’s shop, striking pleasantly. The muleteer Ramiro comes in to have his watch mended. Torquemada’s wife Concepción enters to remind her husband it is time for him to regulate the municipal clocks. She complains that he has not placed one of the two grandfather clocks in her room, as requested. It’s too heavy to move, he responds. He asks Ramiro to await his return while he goes about his business. Concepción and Ramiro stand looking at one another. She hints at having the clock carried to her room. Nothing easier, says the muscular muleteer. As he takes it upstairs, Gonzalve is heard arriving. Concepción’s lover is a poet who waxes lyrical as they prepare to fling themselves into each other’s arms. On his reappearance she thanks Ramiro. To get rid of him again, she asks him to move the other clock upstairs, bringing the first one back. While he goes back upstairs to retrieve the first clock, Concepción shoves Gonzalve into the second. Suddenly the banker Don Íñigo turns up, enquiring after Concepción’s husband. It was he, he admits, who appointed Torquemada to the job of looking after the town’s clocks to get him out of the way. He tries to take Concepción’s hand. The return of Ramiro with clock number one saves her. Ramiro picks up the second clock (containing Gonzalve) without difficulty. Concepción is impressed and follows him upstairs. Left alone, Íñigo decides he would improve his image as a playful lover by hiding in the remaining clock. As he does so Ramiro reappears, charged by Concepción with minding the shop. Suddenly she returns, complaining at the upstairs clock’s noisy innards. Would Ramiro kindly bring it back down? He instantly obliges. Íñigo declares his love to Concepción. She begins to see his potential. Ramiro returns with the first clock (containing Gonzalve) and offers to take up the second (containing Íñigo). Concepción accepts his suggestion. Opening the first clock, she tries to dismiss Gonzalve, who is reluctant to leave. She deserts him and he retires into his clock as Ramiro returns. He looks around the shop with admiration; if he were not a muleteer, he would like to be a clockmaker. As Concepción returns, he divines her unhappiness with the second clock and goes to retrieve it. Left alone, Concepción expresses dissatisfaction with both her lovers. As Ramiro returns yet again, she appreciates his physical strength. She sends him back to her room – this time without a clock to carry – then follows him. Íñigo and Gonzalve peep out of their hiding places, shutting themselves back in as Torquemada returns. He apologises for keeping them waiting. Noting their interest in the insides of the two clocks, he insists that they buy them. Ramiro and Concepción return and all join in the moral: in the pursuit of love, there comes a moment when it’s the muleteer’s turn. - With thanks to Glyndebourne Opera Festival.